Who Killed David Crowley and Family? On Saturday, January 17, 2014 at around 1pm, police were called to the 1000 block of Ramsdell Drive in Apple Valley, Minnesota, to the home of filmmaker David Crowley, after neighbor Collin Prochnow reported seeing bodies and a black handgun lying in view of the front living room window. Prochnow immediately called Apple Valley police. He said that initially it appeared that his neighbors of over one and a half years hadn't been seen at home for weeks, and they had Christmas delivery packages that were piling up on their doorstep. He also said that he "Never heard any yelling, never heard any screaming--a husband and wife fight, or anything like that." Upon arriving at the scene, police found the family dog, Paleo, inside the home, quite frantic and very upset. 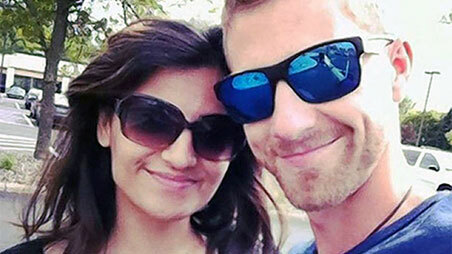 After further inspection of the one-story rambler, police found three dead bodies on the floor of the living room, 29 year old David Crowley, his 28 year old wife Komel, and their 5-year-old daughter, Raniya. All three had suffered gunshot wounds to the head. The Hennepin County medical examiner's office is the official coroner of record, and they confirmed the identities of the bodies, saying that all three died of a gunshot to the head. Raniya and Komel Crowley's deaths were ruled homicides, yet David Crowley's death was ruled a suicide. The interesting thing about this case is that even though police officials immediately pronounced the deaths as an "apparent" murder-suicide, they did so despite the glaring, overwhelming fact that the sliding glass door in the back was suspiciously found open (in the wintertime) when police arrived, a fact that was exposed by the police dispatch recordings fom the event, as collected by MnPoliceClips.com. This evidence has surprisingly enough not been reported by the mainstream media, or has been tragically downplayed. Instead, the media has seen fit to disparage Crowley's character, rather than examine what could be a major clue in the case. The Apple Valley police are working in conjunction with the Minnesota Bureau of Criminal Apprehension and the Dakota County Sheriff’s Office, but it's not clear who made the call on the "apparent" double murder-suicide determination. The medical examiner also lists Saturday, January 17 as the date of death, the day the bodies were found, yet neighbors and family members say they hadn't seen nor heard from the Crowley's for nearly four weeks! This shoddy work by the medical examiner isn't even up to the TV standards of "Quincy" or CSI. As for the mainstream corporate media missing all of this... it's par for the course. It's most curious that the medical examiner has given that day, January 17, as the date of death. One can only hope that it is accurate and was arrived at in a scientific, forensic fashion. If indeed Saturday, January 17 remains as the official day of death, well, that raises more questions, and points out a couple of very significant incongruities..
Point 1: Friends, neighbors and family members say they hadn't seen nor heard from either of the Crowley's for four weeks. Neighbor Prochnow said that he had not seen any of the Crowley family members since before Christmas. Point 2: Prochnow also told reporters that he recalled a night in December when he awoke to something that sounded like gunshots, but he never thought anything of it at the time, until Saturday, when he discovered the bodies. That's very compelling eyewitness testimony, and for some reason, it somehow appears to be lost on the authorities, in light of their immediate presumption of a murder-suicide. For the coroner to not determine an exact date and time of death is odd in the least and flies in the face of a thorough investigation. The date of death also does not seem to fit with the families last known date of contact, which was one week prior to Christmas. Four weeks without a call to anyone, especially on Christmas or New Years? Investigators have reportedly already determined that the last verified activity at the residence was in late December, so why did the coroner go with January 17, nearly three weeks later? For these reasons, it's hard to believe that January 17 was the day that the Crowley's died. The long absence away from family and friends before then is what makes it so hard to fathom, so hard to accept. Even though officials are already calling this an apparent murder-suicide, local authorities say that their investigation is ongoing. To what actual extent and scope the investigation continues, is yet to be determined. According to Apple Valley Police Chief Jon Rechtzigel, there were no previous police calls to the Crowley family's home in the past. They were a peaceful family by all accounts. David Crowley was an Owatonna, Minnesota native, and a U.S. Army veteran. He served honorably for five years, beginning in 2004. He was stationed in Iraq, Afghanistan and Germany, as well as Texas. Crowley left the Army in 2009 to pursue his dream of becoming a filmmaker. Crowley also attended the Minnesota School of Business. Komel Crowley was a registered self-employed dietitian. She studied at Baylor University in Texas and at the University of Minnesota, where she earned a master's degree in public health in nutrition in 2012. Her business was called Mind Body Dietitian. She specialized in treating eating disorders. The pair met in Texas, when Komel was at Baylor and Crowley was stationed with the Army. 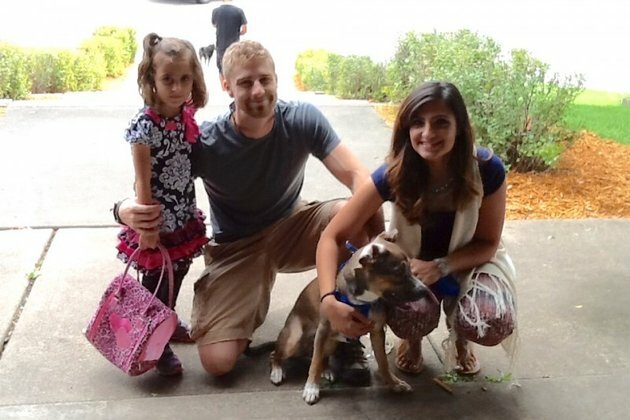 They met and married within three months, in 2008, shortly before Crowley deployed to Iraq. After leaving the service, Crowley and his new wife moved to the Twin Cities, where he began his dream of becoming a filmmaker, and she became a registered dietitian with her own company, called Mind Body Dietitian. One neighbor said they were the picture perfect family. "They were like that couple that finish each other's sentences ... and you're like, 'Shut up, please. You're too cute.'" One friend also adds that they always doted on their daughter. According to all accounts, they were indeed, a happy young couple. 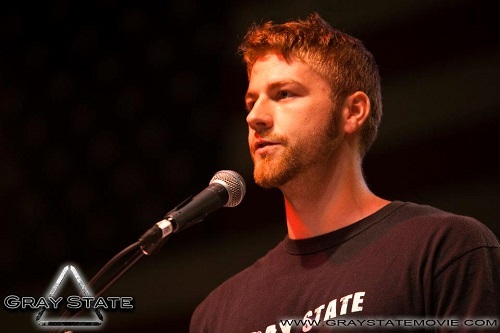 Crowley began working hard at his craft and eventually wrote the screenplay for his first feature movie called, "Gray State: The Rise." It depicts a world not too far in the near future, where the economy crashes and the government stoops to new lows, ruled under an imposing police state, where people are subjected to RFID chip implants and indefinite internment in FEMA camps. The trailer for the film shows FEMA agents clashing with protesters and then killing select captured Americans; not a message that's going to endear you to the government. The premise of the film is, Americans fighting a 2nd revolution against unchecked police power and oppressive military might, spawned by a tyrannical, out of control government which rules under martial law. The film has been roughly five years in the making. Once the trailer was released, the concept caught on and has gone viral within the internet community, recording nearly one-million views after its initial debut release. "The world reels with the turmoil of war, geological disaster, and economic collapse, while Americans continue to submerge themselves in illusions of safety and immunity. While rights are sold for security, the federal government, swollen with power, begins a systematic takeover of liberty in order to bring about a New World Order." It is because of Crowley's work on 'Gray State' that the mainstream media has seen fit to paint Crowley as a semi-deranged filmmaker, hell bent on guns and conspiracy theories. Yet according to the people who knew Crowley best, his close friends, he was anything else but that. Charlie Hubbell said that he was "blindsided" and "shocked" when he heard about the deaths. "He seemed more grounded and focused than would lend itself to anything chaotic," Hubbell said. "The entire time I worked with him there was nothing aggressive or chaotic or strange or abnormal. He was one of the ones I was hanging my hat on, one who was going to succeed." "This is not the David that I know. This is nowhere near the David I know. He was proud of his service. He was proud of his expertise." Mitch Heil said, "He was a charismatic leader and creative person." Paul von Stoetzel, a Minneapolis filmmaker, said that Crowley and his colleagues were good people and had huge dreams for their film careers. Jason Allen, a producer based in Los Angeles, said that Crowley’s words and actions when the two met in September, and in an e-mail Crowley sent him on December 17, all seem very contradictory to a man who was about to kill his family and himself. "We talked about his vision for the film Gray State, a depiction of future events in a post-collapse America he recently launched. Mr. Crowley was very articulate and outlined his vision well. It was obvious that he had big plans for his project, and even bigger plans for his future. I recalled him being very detail oriented, and knew that creating this movie was not going to be a small or short project." "In addition to the film project, we discussed other matters – personal matters. He spoke of his wife and daughter with the pride of a loving husband and father. He spoke of past events that brought him to this point in his life. He spoke of what he saw as a country in dire trouble from a ruling elite who were bent on destruction of our country and our way of life. He was not, however, fanatical about what he saw taking place. He was reserved, measured and practical." "It was during our conversation that I chided him a bit about the dangers of his undertaking, that it might not be a popular move to appear on our radio show in the run-up to the 2012 elections. He chuckled and said that he was glad to have any opportunity, no matter how big or small, to expose the machinations of the corrupt and the complicit who were destroying the country in which his daughter would grow up." "It was during the latter part of our conversation that he made the statement that is most unsettling and troubling to me. It was six months after the death of Andrew Breitbart and five months before the “accident” that claimed the life of Michael Hastings." "What I don’t understand is the public’s acquiescence or resignation to the official narrative without question, especially considering the people whom we’ve lost to questionable, if not outright strange circumstances." "There is something very wrong here." "The death of David Crowley, his wife and daughter is more than a tragedy. It seems to fit a disturbing pattern." "We need the complete truth about what happened, and not accept anything less. Although his death and the murder of his five year-old daughter and 28 year-old wife could have been by his hand, I’m not buying it. Others aren’t either," Hagmann concluded. Again, these are people who knew or had actual contact with Crowley, and none of them are convinced in any way, shape or form that he could have perpetrated something so brutal and extreme, especially against his cherished family. And then there are the "actions" of Crowley, leading up to his death. In September, Crowley flew to Los Angeles for a meet and greet with potential backers, financiers, and producer-types. According to Jason Allen, Crowley seemed upbeat and positive about the project after his trip. Crowley had told Allen in his December 17 email that in a few weeks he would release a two and a half hour documentary called “The Rise,” a manifesto on the Gray State model, as well as a few new trailers for a Gray State series. "When you see The Rise, and the new trailers for the #GRAYSTATE series, you'll know what I mean when I say I have followed my heart at every step," he wrote. He also asked Allen if he wanted to be an executive producer and help out with the logistics of the Gray State film project. "Jason, you know exactly what to do with this," Crowley wrote. Hardly the words of a man who has given up the ship and lost all hope. In September, Crowley also fielded questions from followers on Facebook about the film, telling followers that the film would still be forthcoming. Crowley also went on to write that his wife Komel was helping out by building a database of film professionals, actors and other movie industry contacts that were or might be interested in the project. Crowley said that this type of promotion and marketing would generate a "time bomb of public interest!" From what Allen could see, the drive and unbridled enthusiasm expressed by Crowley did not exemplify a man who was about to give up on his dreams, let alone his life. According to Allen, "He was very much excited about releasing this documentary about his movie." "Maybe the work load got too crazy; I don't know the personal reasons, but at the end of it all here I am at the end of the tunnel all alone. The fans continue to gather, but they're frustrated and despondent. No one believes anymore." It would be nice if someone could actually attach a name to that quote, if only to verify that it was actually said. “Gray State fans are growing at a rate of 100-200 per day even now, and when I get started I can only expect they’ll keep coming." That's a very odd dichotomy from the unknown LA assistant producer who alleges that Crowley said about the film's fans, "They're frustrated and despondent. No one believes anymore." So, there are some things about this story that clearly do not add up, yet the mainstream corporate media has all but donned the role of judge and jury, shamelessly excoriating Crowley's name before the bodies were even cold. It sounds as if Crowley was already a marked man, as he mentioned that the Rise project suffered a catastrophic hard drive loss earlier last year, in 2014. It appears that the big key will be... if the medical examiner revises the time of death, or leaves it as is. We'll see how this plays out. So far, we know that Crowley was reportedly said to be alive around December 17, one week before Christmas. It's after that point that no one seems to know what happened to the family. After that, Crowley's brother, Dan, stopped by and left some Christmas presents on their doorstep shortly after Christmas, around December 26 or 27. He says he didn't knock because he didn't want to bother the family, but he saw the family's dog, Paleo, in the front window. Here's another topper though that the media is not really talking about much, allegedly Crowley left a two sentence note behind. When asked about the contents of the note, friend Mason Hendricks would only say, "It goes into some stuff that needs to be looked into later." “It’s very short. It’s very puzzling. Honestly it doesn’t... it doesn’t put much into perspective. It’s two sentences. That’s all it is,” said Hendricks. Well, talk about a teaser! Why this note hasn't been released yet is most curious indeed. Another interesting development to note is that the relationship with longtime friend and business partner Mitch Heil abruptly came to a halt in September. Heil was partners in a video production company with Crowley and also in a business known as the Bullet Exchange, a company that trains actors to use military and police weapons and gear in film. The two were good friends in high school. After graduating, they joined the Army together, but were stationed in different places after basic training. They reunited again in the Twin Cities to form the Bullet Exchange, their actor-training company. "When it came to business stuff, he was the brains behind everything. I was just there assisting him to reach his vision." Heil hadn't spoken to Crowley since September when they parted ways in business. One other aside from this tragic story--while members of the Crowley family have been having a hard time in dealing with the sudden tragic deaths, Komel's family has also been horribly shaken with a double family burden, her mom is battling severe cancer. A fund has been set up for her at www.gofundme.com/kjrrqw. There are more links below for more information. Funeral services are set for next week in Owatonna. On Tuesday, there will be a visitation from 3 to 8 p.m. at Michaelson Funeral Home. On Wednesday, a memorial service will be held, followed by a reception at 11 a.m. at the VFW. NewsFocus: There are many things that are disturbing and not right about this case. How the police arrived at the immediate conclusion that they did is a compelling question to ask. 1) The fact that the back sliding glass door was already open (in winter) when the AV police arrived on the scene is a very substantial clue. How this can be dismissed out of hand is just incomprehensible. 2) The fact that the coroner can claim that Saturday, January 17 was the day of death, even though the family was out of contact for over four weeks, is quite hard to swallow. No one received any calls from December 17th onward. Think about that. Not one call. Again, four weeks without a single phone call to anyone, especially on Christmas and New Years? How the coroner can claim January 17 as the day of death is beyond all logical reason. 3) The next door neighbor who found the bodies (Mr. Prochnow) also claims to have been awakened by "gunshots" late one night in December. Gunshots late at night are always suspicious. Let's face it folks, a family suicide might more often than not be committed in daytime or the evening, but gunshots "late at night"... the kind that wake you up from a dead sleep, from next door... well, those should obviously be scrutinized. How do the police dismiss this major piece of critical evidence and decide instead to go with an "apparent murder-suicide," rather than remaining open to the possibility of foul play? 4) The fact that the dog was alive is very curious. The 5-year old girl was killed, but the dog was spared? Why leave the dog behind? The fact that the dog is still alive could suggest more than one thing. Was the dog familiar with the killer, so it did not bark or attack? Was the dog spared because it hid when it heard the gunshots? Sadly enough, we very well may never know. It would be interesting to know the dog's physical condition. That would tell how long the dog had been captive with no one to feed it. According to the neighbor, Mr. Prochnow, "That dog looked thin, and he was already skinny to begin with." So, with this said, how is it that the medical examiner can possibly say that the day of discovery for the bodies was also the day of death, January 17? The dog's condition doesn't seem to suggest that. The Crowley's loved their dog and took good care of it. That is born out by the numerous videos and pictures available, yet its gaunt physical appearance when found by the police, appears to suggest that it was without food for some time. 5) The impending film plans and the September flight to LA do not suggest a man who was resigned to failure with this project, nor someone who had given up the ship and lost all hope. The email to Jason Allen on December 17 shows that the fire was still alive with Crowley and that he had not given up on the film, contrary to the portrayal that some in the media have suggested. 6) The two-line note allegedly left behind by Crowley that Hendricks remarks about, "It goes into some stuff that needs to be looked into later. It’s very short. It’s very puzzling." Since no one has submitted this note as evidence of a suicide, it's curious as to what it does say about something that needs to be looked into. All done in just two lines. This alleged note is one of the oddest things of all regarding this tragic case. The fact that it hasn't been made public and used to support the murder-suicide theory is very telling. This statement, coupled with the remarks of close friends, does not add up with those who would say that Crowley did the shootings. One other note, the neighbors originally said that the front drapes were seldom ever open. Also, Mr. Prochnow said the bodies from the window actually looked like mannequin parts, but upon a closer look he noticed what he thought were fingernails and decided to call police. All in all, it's unsettling to see this from across town. This is in my backyard. It's tough to watch this happen right next door. It's even tougher when you see the numerous incongruities in the case, and yet there are multiple unanswered questions or disregarded facts. And with the nature of Crowley's film being so close to what we see happening today, it's hard to see how anyone can possibly say unequivocally and categorically that this was absolutely 100 per cent not an organized professional hit, to prevent not only the release of Gray State, but to also send a message to other filmmakers, documentary producers and independent reporters. We have officials within our government who have turned against this country in a collaborative act of treason. If you don't know that by now, you're watching too much TV and not paying close enough attention to what's going on around you. A potential "alphabet" hit is certainly well within good reason and needs to be seriously investigated, to the fullest extent possible. Truth be told, it could have been anyone, but who had the motive? Perhaps this was the work of a disgruntled investor or ex-business partner... or... was this as many suspect, an organized hit from the infamous CIA death squads that now operate freely, with impunity in the US since 9/11, all with White House approval and direction. The truth is, it's the "powers that be" who are scared. Otherwise, they wouldn't have to unlawfully murder innocent people in order to save their own hides from a death sentence or life in prison due to all the crimes and atrocities they've committed or been a part of. In the meantime, their goal for a new world order marches on. 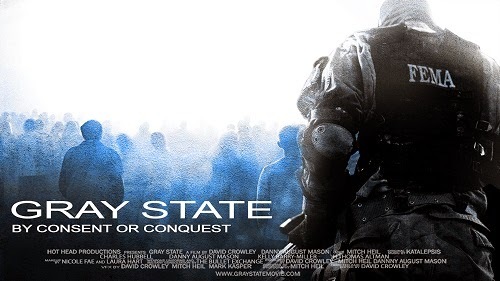 With any luck, and some possible divine intervention, the remaining production team left can hopefully see this Gray State film project through completion, not only on behalf of the Crowley's, but to serve David's dream of exposing this post 9/11 police state for what it is, and all those who are behind it.